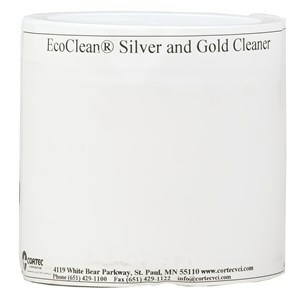 EcoClean Silver & Gold Cleaner is specially engineered to safely and effectively remove oxides, grease, oils and other contamination from delicate metal contacts of silver or gold commonly incorporated in electrical and economic equipment. Biodegradable and formulated to be free of harsh abrasives and toxic chemicals, this product is user and environmentally friendly. Additional uses include cleaning fine silver and gold jewelry, silver dining service pieces and more. Users will find this product provides superior cleaning and protecting actions and ease of use over other products of its type. VpCI enhanced to eliminate the need of constant re-cleaning and polishing. Biodegradable and non-toxic. Store at room temperature. Keep from freezing. 16 oz. jar. Apply sparingly to contacts or area using a foam or chamois swab dampened with compound. Use a gentle rubbing action to assist cleaning action. Remove excess product and gently polish contacts or area using a clean, dry foam or chamois swab. The parts may immediately be rinsed under warm, running water then buffed dry with a soft, dry, absorbent cloth. Heavy oxidation may require gentle rubbing of the compound before rinsing.